Each level-tablespoon serving (9 grams) contains 7 grams of soluble and insoluble fibre primarily from psyllium and oat, along with organic apple, organic aloe vera, gentian root, alder buckthorn, potassium alginate, beetroot, and cinnamon. This combination of effective nutrients helps to keep you regular, curb your appetite, and maintain your ideal weight. New Users: Mix 1 level scoop (11.5 g) once daily with 8 oz. of cold water. Increase amount gradually during a two week period to 2 level scoops (23 g). Suggested Use: Mix 2 level scoops (23 g) with 16 oz. of cold water or your favorite beverage. For best results, use a shaker cup and drink immediately. For best results, drink 8 glasses of water each day. As a snack between meals, follow the New Users directions. 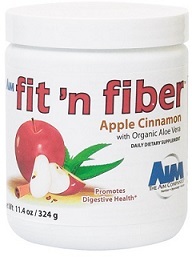 When combining with Herbal Fiberblend, mix 1 or 2 level scoops of fit �n fiber� and 1 serving of Herbal Fiberblend with 16 oz. of cold water or your favorite beverage.